It is a form of autonomic dysfunction (also known as dysautonomia). When a person with POTS changes posture (stands up), their bodies do not respond properly. Instead of keeping their blood volume IN PLACE when changing posture, a person with POTS blood volume falls into their legs and feet. Their blood pressure then drops and their heart starts pumping frantically to try to get the blood evenly distributed to the body. The resulting lack of blood flow to the brain and extremities causes numbness, tingling, dizziness, palpitations, and eventually collapse if the person doesn’t sit down again. My blood pressure likes to drop to 80/50 and I have to fight to maintain consciousness. Other times my heart rate will spike to over 140 beats per minute approx. three minutes after I stand up (that is double my heart rate!). It is not comfortable nor fun. Getting a POTS or autonomic dysfunction diagnosis requires seeing a neurologist who specializes in conditions of the autonomic nervous system. I got mine after uptilt-table testing in Boston (twice!). I get POTS when my autoimmune disease is flaring (or when I have an infection of some sort), and I get “impairment of the parasympathetic nervous system” all the rest of the time. It is this last diagnosis that really helped me to understand autonomic dysfunction. I’m about to explain what I learned to you. It’s complicated, so bear with me! Let’s start with the basics: THE AUTONOMIC NERVOUS SYSTEM (ANS) and its 2 main components – the sympathetic nervous system (SANS) and the parasympathetic nervous system (PANS). You don’t have to think consciously about these systems for them to work. The ANS provides the connection between your brain and certain body parts, including internal organs. For instance, it connects to your heart, liver, sweat glands, skin, and even the interior muscles of your eye. The ANS includes the sympathetic autonomic nervous system (SANS) and the parasympathetic autonomic nervous system (PANS). 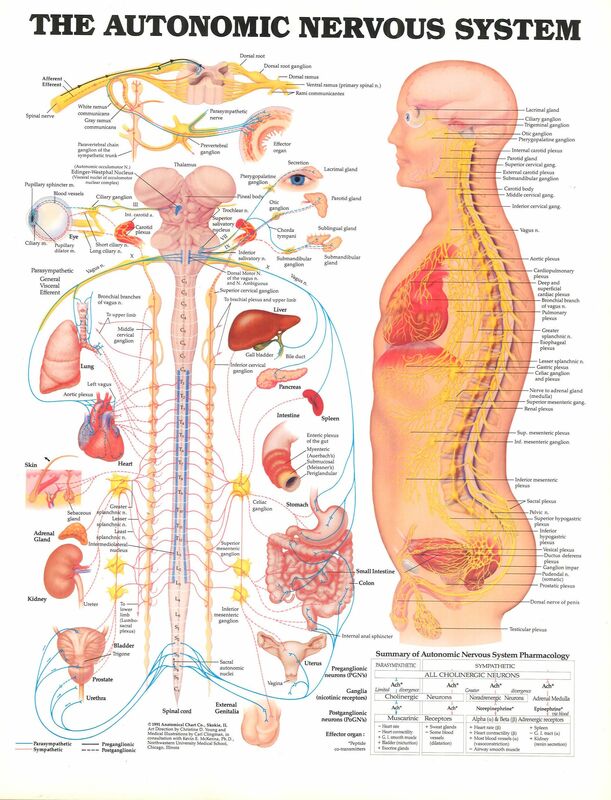 Most organs have nerves from both the sympathetic and parasympathetic systems. The SANS usually stimulates organs. For example, it increases heart rate and blood pressure when necessary. The PANS usually slows down bodily processes. For example, it reduces heart rate and blood pressure. However, the PANS stimulates digestion and the urinary system, and the SANS slows them down. The main responsibility of the SANS is to trigger emergency responses when necessary. These fight-or-flight responses get you ready to respond to stressful situations. The PANS conserves your energy and restores tissues for ordinary functions. Autonomic nerve disorders (dysautonomia) refer to disorders of autonomic nervous system (ANS) function. Dysautonomia is a general term used to describe a breakdown or abnormal function of the ANS. The autonomic nervous system controls much of your involuntary functions. Symptoms are wide-ranging and can include problems with the regulation of heart rate, blood pressure, body temperature, perspiration, and bowel and bladder functions. Other symptoms include fatigue, lightheadedness, feeling faint or passing out (syncope), weakness, and cognitive impairment. Orthostatic intolerance refers to impairment in the body’s ability to handle gravity. When a person stands, blood pools in the abdomen and legs. Normally, the autonomic nervous system will compensate by constricting blood vessels and pushing the blood to the brain. When autonomic pathways are damaged, these reflexes, termed baroreflexes, do not function adequately. As a result, the person becomes dizzy, light-headed, and may faint. In addition, digestion is controlled by the autonomic nervous system. When the ANS malfunctions, the “victim” commonly develops gastrointestinal problems. Symptoms include nausea, bloating, vomiting, severe constipation, and abdominal pain. Oh hey, look at that – it is an unconscious system in the body which controls basic things – so I don’t have to think about them! But there is more! It also IS THE CENTER OF THE FLIGHT-FIGHT-or-FREEZE STRESS RESPONSE. Interesting… right? Isn’t that also where PAIN IS PROCESSED IN THE BRAIN? The same place these nerves throughout my body are sending signals about how to react to the environment? INTERESTING…. BUT, LET US KEEP LOOKING AT THE SANS AND PANS – the components of the unconscious stress responses system. How do these nervous systems gather information from the body and its environment in order to determine my heart rate, body temperature, how I feel sensations, etc etc? Soooo, take a look at that! Now I can see exactly how the brain connects to my body through my ANS! Let’s focus a second – use me as an example. I have chronic parasympathetic nervous system impairment. My SI joints (levels S1-S5) are also completely destroyed because my autoimmune disease attacked them. This affects the nerves at those levels in my spinal cord. There are a lot of blue lines down in the sacrum – which connect the parasympathetic nervous system from brain to spinal cord to organs in my pelvis/lower abdomen. These are the organs I have the most problems with – they seem to do whatever they want when it comes to GI smooth muscle contraction, bladder sensations etc. When my autoimmune disease was actively attacking the S1-S5 area of my spine, I had full POTS symptoms – ALL the organs connected to the spinal cord with a blue line (indicating parasympathetic nervous system) were freaking out. When the autoimmune process is not in attack mode, I merely have impairment of the organs directly connected to parasympathetic system in the S1-S5 region. SO – nerve problems in that area are driving my autonomic dysfunction. I also have severe pain in this area that limits my mobility (degenerative sacroiliitis will do that). When the pain flares, the ANS malfunctions. Direct connection, proportional correlation. How this looks in reality is simple. When my fight/flight response is activated by either environmental stimuli, emotions, stress, fear, or pain – my sympathetic nervous system rares up and gets me ready to either fight or flight like normal. But, when the stressor is over/gone, my parasympathetic system DOES NOT PROPERLY RETURN MY ANS TO BASELINE. So, essentially, I get stuck in a heightened stress response. This continuous heightened stress response then takes a toll on my body, my mind, my immune system… causing my autoimmune disease to flare, causing the system to get into an even more heightened stress response… and on and on this cycle goes until something is done CONSCIOUSLY to stop it. This heightened stress response not only causes the body to break down faster, but it also can lead to stress disorders or trauma-related disorders. THERE IS A REASON PTSD IS ASSOCIATED WITH AUTONOMIC DYSFUNCTION FOLKS! It changes how your brain processes information – putting more of a strain on the hypothalamus and the subconscious centers of the brain! I mean, look at the definition of HYPOTHALAMUS from google. a region of the forebrain below the thalamus that coordinates both the autonomic nervous system and the activity of the pituitary, controlling body temperature, thirst, hunger, and other homeostatic systems, and involved in sleep and emotional activity. involved in SLEEP and EMOTIONAL ACTIVITY. Remember how I mentioned cognitive behavioral therapy was a good idea for people with EDS? Autonomic dysfunction literally changes how your body and mind interact – and this involves your hypothalamus AND your subconscious. Putting an extra or unbalanced load on either of those things will CHANGE YOUR VIEW OF THE WORLD. So, my friends – this is the connection most people miss. Pain and autonomic dysfunction related to trauma and stress and how all of that affects the body – and how it can be influenced by your SUBCONSCIOUS UNDERSTANDING OF THE WORLD as well as damage done to your body (by EDS subluxations, or over-active mast cell disease, or flaring autoimmune disease!). Once you begin to see how all those parts ACT TOGETHER AS ONE – you begin to see the MIND-BODY CONNECTION in action. You can train yourself to overcome a fight or flight response – an unconscious response controlled by the ANS. You do this through the subconscious, training yourself to not be afraid of something anymore, figuring out why you were afraid of it and what you can do to alter your stress response. Kind of like public speaking triggering the fight or flight response… you train yourself to overcome your unconscious and subconscious quirks (facial movements, fear response, etc). Why can’t the same principle be applied to reducing the imbalanced response of the SANS and PANS within the ANS? This is what I’m doing now. I am re-training my subconscious to help out my PANS by BEING AWARE of my body’s responses and understanding their source. I am doing this with a form of CBT known as DBT (dialectical behavioral therapy) which teaches mindfulness, awareness, and actions to generate changes within the body – all which calm down the stress response and allow my parasympathetic nervous system to do its job better. It is really just about using information to NOT MAKE A SITUATION WORSE. You see how YOU can start a positive loop that propels you FORWARD simply by UNDERSTANDING what is happening in your body?